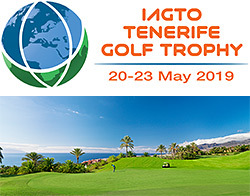 Year-round sunshine will be awaiting the visitors to Tenerife as the island plays host to the prestigious IAGTO Tenerife Golf Trophy (May 20-23, 2019). It's the fifth hosting of the popular tournament, which has previously been staged in Costa del Sol, Costa Brava, Costa Blanca and Costa Calida and is regarded as one of the leading events on the golf tourism calendar. More than 90 tour operators from 29 countries will descend upon the largest of Spain's Canary Islands to discover the many golf, cultural and historic experiences that Tenerife has to offer, as well as meeting with representatives from regional golf resorts, golf courses, hotels and inbound operators. Tenerife features nine courses and a wide variety of layouts: Buenavista and Real Club de Golf de Tenerife in the north, and Golf Costa Adeje, Abama, Las Americas, Golf del Sur, Amarilla, and Los Palos in the south. Tecina Golf is a 40-minute ferry ride from the mainland on the beautiful island of La Gomera. The accommodation options are also excellent and can meet the demands of any type of holiday and several top-class hotels are several taking part in the programme to showcase the destination even further. IAGTO spokesperson, Peter Walton, said: "Tenerife remains a superb destination for golfers throughout the year with its inviting climate. There is rich diversity among the golf courses and the accommodation options are second to none. I'm sure it will be a fantastic event." Tenerife Golf's Carlos Beautell, said: "It's a huge honour to host the IAGTO Tenerife Golf Trophy. We look forward to providing our customary warm welcome and we will be proud to show everyone the quality of our golf courses and the ongoing attraction of our island." The event is just one of the highlights in a busy 2019 on the Tenerife golf calendar as it continues to promote the destination to UK and European golfers in partnership with leading UK agency Azalea. A pan-European group media trip will also take place in April with journalists from countries across the continent experiencing the special attraction of the popular island and the quality, value and depth of Tenerife golf. Average year-round temperatures of 23°c Tenerife provide the ideal climate to enjoy a relaxing golf break thanks to cooling trade winds; while - in contrast to almost everywhere else - golf and hotel rates are generally 20 per cent cheaper in the summer months. The island also offers 70km of beaches and a wide range of cultural highlights and activities both on and off the water, making it the ideal location for a golf break. Tenerife is served by two airports - Tenerife North and Tenerife South - and is barely a four-hour flight from the UK, and no more than a five-hour direct flight from most main European cities. For more details on playing golf in Tenerife, visit www.webtenerife.com/golf | www.facebook.com/TenerifeGolf | @tenerife_golf on Instagram | @TwiTenerifeGolf on Twitter or download the free Tenerife Golf app for iOS and Android. Tenerife is the largest of Spain's Canary Islands and boasts the famous National Park of Teide, a UNESCO World Heritage site and Spain's tallest mountain at 3,718 metres. Located in the north-east of the Atlantic Ocean, Tenerife is just 300km off the west coast of Africa. It is set in a subtropical climate zone, with pleasant spring temperatures all year round, and an average annual temperature of 23°c. The population of the island is approximately 900,000. Tenerife boasts nearly 400km of coastline, 70 beaches and a variety of high-end resorts and boutique hotels, many of which offer leading facilities and spectacular sunset ocean views and including the highest concentration of five-star hotels on a Spanish coastline. The spring climate of Tenerife enables golf to be played comfortably all year round, even in summer, when courses have special offers and the mild, pleasant climate makes the sport even more enjoyable. Its nine courses - including El Tecina on the nearby island of La Gomera - were all designed by renowned golf architects, making Tenerife a paradise for golfers. Add in the vast range of supplementary attractions, including all manner of excellent golf establishments and facilities, combined with a wide variety of leisure activities, an unforgettable stay is guaranteed both on and off the green. There are 20 hotels within the Tenerife Golf brand. All of them offer golf packages to clients, as well as golf-related services in the hotel with golf desk, club storage room, tee time reservation, transfers reservations, club rental requests and anything else required. The hotels are located in the north and south of the island, and also on the island of La Gomera, and all have one or more golf courses less than 15 minutes' drive away. Golf packages can be reserved directly with the hotel contacting their reservation department. All of the participating hotels are here (select Tenerife Golf option in the menu). Tenerife is barely a four-hour flight from the UK. Regular flights are available from many regional airports in the UK and Ireland. Tenerife has two international airports as well as two ports, one in Santa Cruz and the other in Los Cristianos. The Tenerife Tourism Corporation is a membership-led independent body, supported by the public and private sectors, which markets Tenerife overseas as a tourist destination. Tenerife Golf is one of its portfolio of specific brands. High-resolution images of golf in Tenerife may be downloaded from here. General images of Tenerife can be downloaded here.